Tin toys... where the heck would we be without them? In this Toys on Paper feature we focus on the fabulous tin toys that emerged from Japan in the 1960's. Tin Toy Robots are, and always will be, a collector's favorite. This fun page shows Yonezawa's (or 'Cherry Y' brand's, as they nicknamed themselves) Mechanical Man offering for the spaced-out time of 1968. Only one more year to The Lunar Conquest! Speaking of which, the last Mech. Telephone Robot (MIB) seen on Ebay finished at US$18K, reserve not met... which I'm sure was a substantial chunk of the Apollo mission budget. Neil Armstrong, phone home! 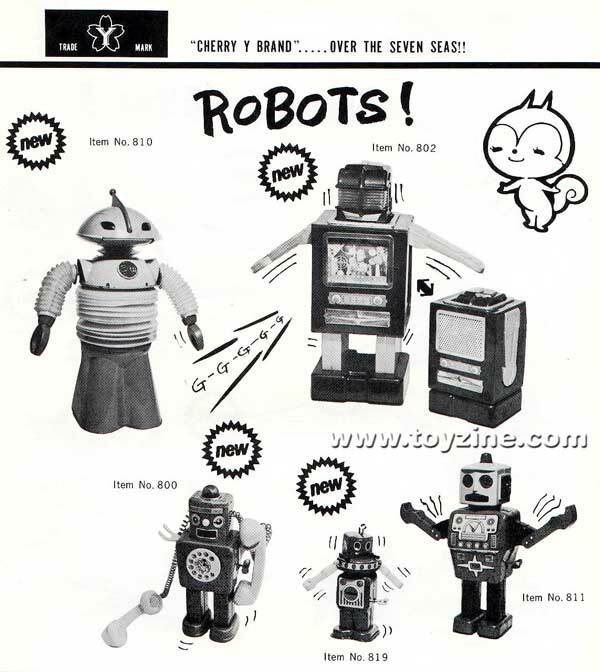 1968 Yonezawa TV space Man, Telephone Robot, and other rare Tin Toy Robots from the company.